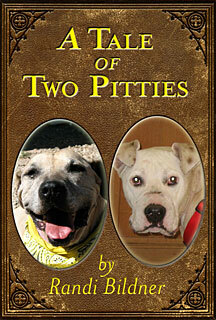 Unlikely bond shared by two neglected pit bulls. A summer of broken hearts leads to a spring of renewed spirit. In August 2009 the collective hearts of New Mexico's "animal community" broke as we said goodbye to Salvador, the beloved yellow pit bull and resident of Kindred Spirits Animal Sanctuary. Salvador left a legacy of love for all who were lucky enough to know him. While saddened to learn that this wonderful creature had crossed the Rainbow Bridge, visions of his magnificent smile linger, while lessons of forgiveness remain deeply ingrained in our souls. Salvador arrived at Kindred Sprits by way of The Santa Fe Humane Society; his badly mangled legs indicated severe abuse and made it difficult for him to walk. The bite marks on his head suggested that he was used as a bait dog for fighting. These challenges (beyond what any being should endure) failed to break Salvador; love, patience and the ability to "know" he was safe restored his spirit. In the true nature of the dog, Salvador did not harbor any bitterness; his pure heart and consummate trust are the embodiment of his species. One cannot help but reflect upon the memory of Salvador’s noble character when meeting Trooper--it is impossible not to draw a parallel about the forgiving nature of the dog. Trooper was named for his will to live and persevere in spite of the most savage treatment, and now it’s his time to teach. His sweet temperament allows us to marvel at the depth of the canine spirit once again. Found wandering in Valencia County on June 4, 2010, Trooper's face was swollen beyond recognition. 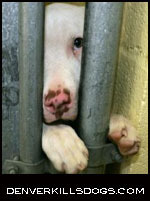 Blood and ticks had gathered in such dense proportion it was difficult for authorities to tell what breed he was. Trooper's wounds suggest that he too was used as a bait dog for fighting. Evidence reveals that Trooper's mouth had been wired shut (a tactic used by dog-fighters) to prevent him from retaliating against aggressive attackers. Veterinarians state that Trooper's collar had become embedded in his neck (a result of being on the dog for too long). A deep gash and pools of blood indicate the collar was ripped off the dog before his rescue. Lynne Kito of Jemez Springs Animal Amigos (the rescue organization responsible for Trooper’s care and Animal Protection of New Mexico's Milagro Award Winner, 2007) states, "When found, the dog's ribs bulged through his body from lack of food and he was covered with ticks." 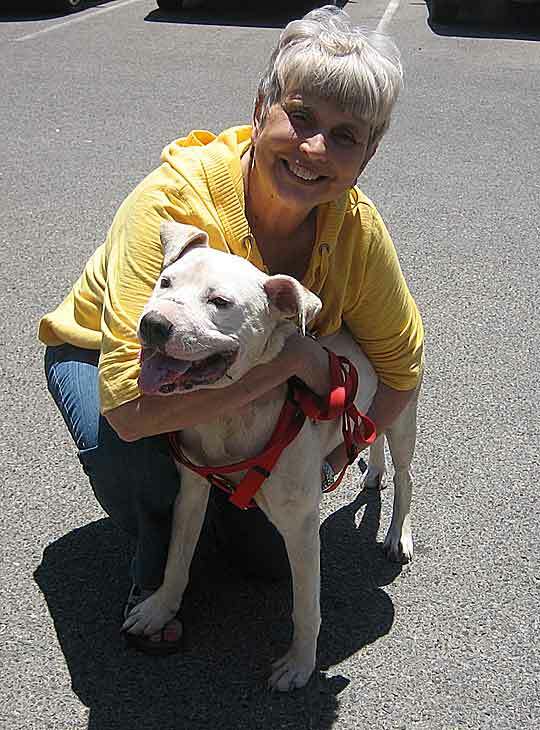 Patty Mugan, Animal Control Technician and Transfer Coordinator for Valencia County found Trooper a wonderful foster home with Claire Leonard where he could mend while awaiting permanent placement. This serendipitous occurrence provides another link between the two dogs. Leonard (a volunteer for Kindred Spirits) knows first hand about the recuperative power of love as well as the resilient nature of the dog. As part of her duties at Kindred Spirits she personally cared for Salvador, preparing a nutritious stew, which served as one of many curative remedies. They say, "time heals all wounds" and this adage proves true with regard to Trooper’s physical injuries. But once again it is the dog's uncanny ability to forgive that transcends time--and above all--human comprehension. A $5000 reward for information leading the arrest of Trooper's abusers is being offered by Animal Protection of New Mexico (APNM). Heather Ferguson, Cruelty Campaigns and Legislative Director (APNM) states "a repugnant crime of this magnitude will be tried as a fourth degree felony." Please call the Attorney General's Task Force Hotline: (877) 5 HUMANE, (877) 548-6263 or Animal Protection of New Mexico's Cruelty Hotline: (505) 821-9142. A forever home for Trooper is pending.